"Captivating characters in an inimitable setting of Cricket, race and revenge; deeply satisfying! The Columbia Review." If you ever wondered why the South African cricket team has not been so successful in the Cricket World Cup, this novel provides what could be the most original, intricate and fascinating theory. The Curse and the Cup by author Gaurav Bhalla is a novel of great ambition. It spans many years, is populated by colorful characters and is drawn on a wide canvas. The story mixes elements of karma, superstition and fantasy with very tangible, real world human conflict, aptly dramatized along the primary thread of the story: the sport of cricket. The story begins back in 1966, when skin color plays an unjust role in denying non-whites a fair opportunity to play, leading to tragedy. A woman then casts a curse on the South African cricket team in order to avenge the death of her husband and son. From that point on, the intricate story takes off, culminating many years later when she knows her life is about to end, centering on an attempt to pass the responsibility for the curse to her grandson. Without giving more of the plot away, suffice is to say that this novel is unique and fascinating on multiple levels. It is reminiscent of such creative works as Playing with the Enemy, The Legend of Bagger Vance, The Natural, Chariots of Fire and Invictus. 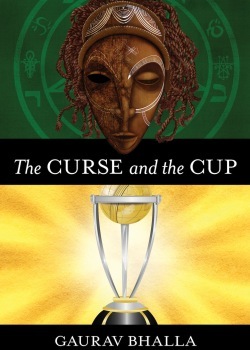 But what stands out is how The Curse and the Cup combines supernatural elements, true historical facts, racial tensions and the charms (pun intended) of a folktale. It takes the reader on a truly mesmerizing journey. The central role of the game of cricket would be a joy to both those who know and love the game, as well as for the uninitiated, who would find this story highly instructive. Told against the painful history of South Africa, the novel reflects on the dominance of white players and the racial divide as an indelible fact of life beyond laws and morality. In that respect, the story explores unflinchingly this intriguing racial aspect of the game as it is played in South Africa, especially when compared to non-apartheid cricket countries, such Australia, Canada, the Caribbean, New Zealand, the sub-continent of India and—last but not least, the seat of the former empire—Great Britain. Beside its human and emotional strengths, The Curse and the Cup tackles the lingering effects of apartheid in South Africa through the prism of colored cricket players. It is a family saga as well as a cricket saga, offering a most human story of racism and loss on a personal level. And while some readers may consider the novel to be historical fiction, its themes of prejudice and acceptance, hate and love, grief and recovery, are timeless and contemporary. It is a well-written story, populated with captivating characters in an inimitable setting, and provides a deeply satisfying conclusion. Highly recommended!